We heard about the Tall Ship coming to Chicago, Illinois to Lake Michigan and decided to go and see them. We where lucky enough to get on a Tall Ship and sail with them. I was spectacular, on the water with all the ships arounds us it was breath taken. Here is some information on Chicago and Lake Michigan. The city is a center for services, business and finance and is listed as one of the world’s top ten Global Financial Centers. The World Cities Study Group at Loughborough University rated Chicago as an “alpha+ world city.” In a 2010 survey collaboration between Foreign Policy and A.T Kearney ranking cities, Chicago ranked 6th, just after Paris and Hong Kong. The ranking assesses five dimensions: value of capital markets, diversity of human capital, international information resources, international cultural resources, and political influence. Chicago has been ranked by The Atlantic as the world’s 4th most economically powerful city, and by Forbes as 5th most powerful. Chicago is a stronghold of the Democratic Party and has been home to many influential politicians. The city’s notoriety expressed in popular culture is found in novels, plays, movies, songs, various types of journals (for example, sports, entertainment, business, trade, and academic), and the news media. 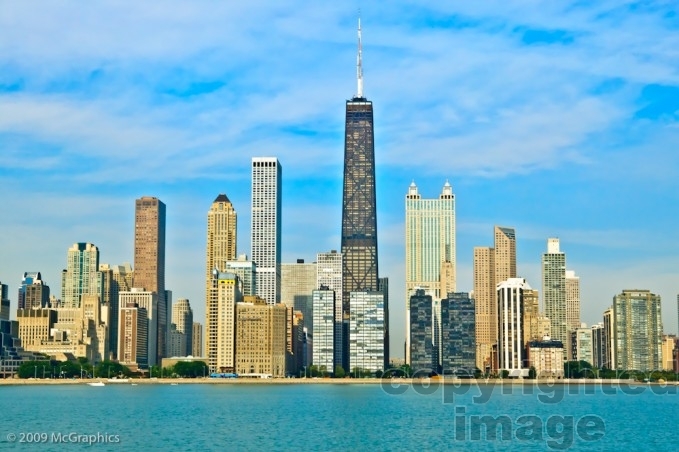 Chicago has numerous nicknames, which reflect the impressions and opinions about historical and contemporary Chicago. The best known include: “Chi-town,” “Windy City,” “Second City,” and the “City of Big Shoulders.” Chicago has also been called “the most American of big cities.” Lake Michigan is the only one of the Great Lakes wholly within the borders of the United States; the others are shared with Canada. It has a surface area of 22,400 square miles,making it the largest lake entirely within one country by surface area (Lake Baikal, in Russia, is larger by water volume), and the fifth largest lake in the world. It is 307 miles (494 km) long by 118 miles (190 km) wide with a shoreline 1,640 miles (2,640 km) long. The lake’s average depth is 279 feet (85 m), while its greatest depth is 923 feet (281 m). It contains a volume of 1,180 cubic miles (4,918 km³) of water. Its surface averages 577 feet (176 m) above sea level, the same as Lake Huron, to which it is connected through the Straits of Mackinac.